Bakers Lodge is in a lovely setting on the south bank of the famous River Nile, and is named after the 19th century explorer Samuel Baker, the first European to set eyes on the nearby Murchison Falls. Buildings are set on raised wooden platforms among tall, shady trees and have sweeping views of the river. There are just ten guest suites, very spacious, with private bathrooms and running hot and cold water. All have decks where you can sit and enjoy the cooling breeze and fine views. The lodge has several boats and specialises in cruises on the Nile. Travelling upstream you'll reach the base of Murchison Falls, and downstream there are opportunities for wildlife watching. Fishing trips can also be arranged. You can also take game drive in the national park known for its diverse animal and bird life, and will have the chance to go chimpanzee trekking in Budongo Forest, an opportunity that should not be missed. When not out exploring, there is a large lounge, bar and dining area where you can chat to other guests and enjoy tasty meals. The gardens are stocked with trees and plants where you'll see and hear many birds, adn there's a pool where yiu can enjoy a refreshing swim. Open: Bakers Lodge is open all year. It first opened in 2014. Location: The lodge is on the southern bank of the River Nile, just downstream from Murchison Falls, in the north west of Uganda. 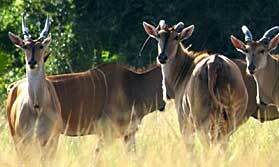 It is 300kms north of Kampala, about a 5 hour drive, and can also be reached by charter flight. Rooms: There are 10 tented suites set on elevated decks. All are en-suite with full running solar-heated water, showers and flush toilets and some have baths. Tents have solar-powered lighting. Each has a private veranda facing the river, and is set well apart from the other for privacy. Netted windows admit ample light. Beds have mosquito nets. In room safes can be provided. Activities: The lodge has its own fleet of boats and provides a number of cruise options. You can take a boat upstream to the foot of the falls, then return to the lodge, or, if you wish, leave the boat at Fajao Gorge to climb to the top of the falls. A cruise downstream on the Nile offers views of animals and birds, and special fishing boat trips can be arranged, for an opportunity to catch Nile Perch. Bakers Lodge also offers game drives in Murchison Falls National Park, guided bush walks, bird watching and chimpanzee trekking in Budongo Forest. Village visits are available. Private meals on board are popular too. Facilities: The thatched lounge, bar and dining areas are set on raised decks to maximise the views and to benefit from the breeze. The lodge has a swimming pool and paved deck with sunny and shaded areas. There are extensive grounds with many plants and trees. There are battery charging points in the central area. Dining: Meals are served in the central dining area, and special private breakfasts, lunches and dinners can be served on one of the boats. There is a wide choice of dishes and a list of wines.